High School seniors listen up! This is your big year, the time when you are on the top of the pyramid looking back at what you have accomplished over the past 12 years. It is a great feeling that is well deserved! Looming ahead is the next step of your life, the one that requires you to make your own decision, deal with your own consequences, and above all, learn how to Adult; yes, the dreaded, Adulting. Having someone there to guide you on your journey into the adult world is a very important step. They go by many names, coach, instructor, mentor, and in this case, Mrs. Brittany Nuzzo-Callen. Leah’s journey at WVJC-Morgantown has brought her face to face with many new challenges; including finding the balance between the academic workload, travel time and a job. But through it all, Mrs. Nuzzo-Callen has been there to help guide, support and push Leah to be her best. The dedication and hard work has paid off for our WVJC-Morgantown Medical Assistant student Leah Tennant. She currently carries a 4.0 GPA and is setting herself up for her goals, to positively impact others by service first as a Medial Assistant, and later as a Registered Nurse. Leah has shown herself to be a hard-working, dedicated, and above all, positively driven student. 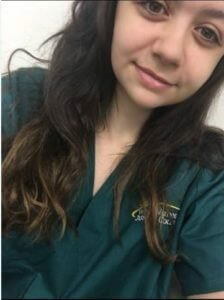 We at WVJC-Morgantown are proud to have Leah Tennant as a Medical Assistant student with us. We, and especially Mrs. Brittany Nuzzo-Callen, look forward to all of her Adult adventures and success. If you are a High School senior looking for that next step in life, check WVJC-Morgantown out at our website here WVJC.